Considered one of the world’s most iconic premium cigar brands for quality, mellow flavor and sweet aroma. The Macanudo cigar brand with its consistency and smoothness is still going strong today. Leading the forefront, the Macanudo Café. Each of the styles of these hand-rolled premium cigars share the same mild blend of Dominican and Mexican long fillers shrouded in a flawless, U.S. Connecticut shade wrapper leaf. The taste of these handmade cigars are pure quality craftsmanship delivering mild flavors with short finishes that provide a smooth smoke. 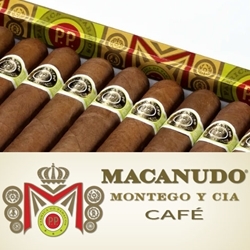 Macanudo Café has been endorsed by Cigar Insider (sister publication to Cigar Aficionado) with a rating of 90. Try one of the varieties of sizes and flavors listed below. Each of these styles are available today for a discount price! Call us for more details!